Summary of today’s show: The Real Presence of Jesus in the Eucharist is something all Catholics should know and rejoice in – St William Parish is teaching Tewksbury parishioners about the it through their Perpetual Adoration Chapel. Today we focus on the events leading up to the 5th anniversary celebration of the Chapel. Fr John Hanley, who started the Chapel; Eileen Wood, who helps run the Chapel now; and Tim Francis, who will be speaking in two weeks join Scot for a discussion on how spending time with Jesus in the Eucharist can enhance our faith lives. 1st segment: Scot started the show by wishing everyone a happy Halloween, that it be safe and a good preparation for All Saints Day tomorrow. Today is also the last day to pre-register at a lower price for the WQOM Catholic Conference on Saturday December 10th. The conference will feature Brian Patrick, Fr Mitch Pacwa, Dr Ray Guarendi, Cardinal Sean, and Sister Olga Yaqob. Register Online for the WQOM Catholic Conference! Scot also reminded everyone that tomorrow is All Saints Day, a Holy Day of Obligation. Scot also announced that a special Mass for All Soul’s Day will take place on WQOM at 2pm with Cardinal Sean. He concluded the segment by asking for prayerful support of The Station of the Cross Fund Drive that will be this week on Wednesday, Thursday, Friday, and Saturday. 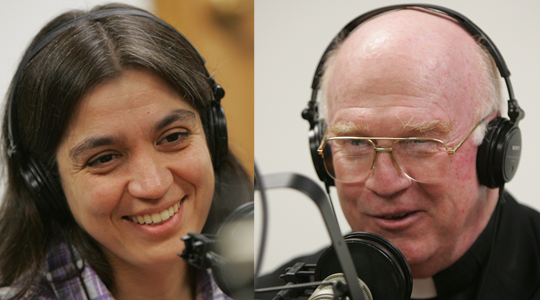 Your prayers and generosity help keep WQOM on the air. 2nd segment: Scot welcomed Fr John and Eileen to the program. Eileen is a parishioner at St William’s in Tewksbury, and Fr John just completed 8 years as pastor at the parish. Fr John explained that when he arrived at St William’s in 2003, the three previous priests had been transferred out at the same time. The popularity of adoration was rising due to ACTS retreats and other events, so he brought up the idea of a perpetual adoration chapel to the Parish Council to build on their Tuesday all-day and Friday overnight adoration programs. The Council prepared for the next 8 months to start the program – getting volunteers, making the physical space, and organizing the logistics. The decision was made to open the Chapel on the feast of Christ the King. Scot emphasized that there are only five or six perpetual chapels in the Archdiocese, making it even harder for St William’s to launch it. Fr John said they recruited friends and family from the parish and all over the greater Lowell area. Eileen was involved from the beginning, having helped organize previous adoration programs. Eileen said that about 80 to 85% of the adorers are parishioners at St William. Scot asked what times are the hardest to fill – Eileen said surprisingly it isn’t the middle of the night or early morning, but weekend afternoons when people might have to give up family events or travel. She said that the very first call she got when they announced the schedule was a man who wanted to reserve Thursday morning at 3am! Scot asked about the profile of the people who come in late – Fr Hanley said that some people like to wake up early, but many are late shift workers who may come at the end of their work day. Scot asked what preparations and education the Council did to recruit volunteers. Eileen said they published a long series of bulletin inserts to answer questions about what perpetual adoration is, what people do during adoration, why adoration is important, and more. One parishioner, Eileen continued, was touched by the comparison of adoration to having a private audience with your favorite celebrity. Scot asked about what the fruits to the parish are from the adoration chapel. Eileen said that the community became more devoted, retreats were more full, and the parish became more of a family. She said that sometimes Catholic parishes don’t follow suit of our other Christian brothers and sisters in that regard – the combination of the retreat program makes everyone more close. Fr John agreed with Eileen, and added that the community came together in their beliefs for everyone, not just those who participated in the adoration ministry. Eileen said that the adorers are everyone from high school students whose parents carpool to adoration to older parishioners and religious education students. Fr John said the biggest surprise for him was how easy it was to get late night and early morning adorers to sign up! 3rd segment: Scot asked Eileen to give an overview of the three main events that St William’s is hosting to celebrate the 5th anniversary of the adoration chapel. The first event is the Vatican International Exhibit on Eucharistic Miracles – a large display of Church-approved Eucharistic miracles throughout the world. The exhibit will be in the lower church from November 12th to November 20th from 8am to 8pm. After Masses on the weekend, there will be a children’s level story reading so that children can learn about the miracles on their level as well. The exhibit has 159 panels featuring many maps, pictures, and information about the miracles. The second event on November 14th, 15th, and 16th features speaker Tim Francis. Eileen said that the event will be run like a parish mission – Tim will be speaking about both Eucharistic and other miracles that science has verified but cannot explain. The third event is on Saturday, November 19th with Jesse Romero from 8am to 6:15pm, including lunch, the Angelus, chaplet of Divine Mercy, and Mass at 4pm. Jesse will be speaking at an all-day event, covering topics such as what Christ the King should mean to all of us, how to deal with loved ones leaving the Church, and the importance of the Eucharist in our lives. Eileen stressed that the events are open to all, not just to St William’s parishioners. 4th segment: Tim Francis joined Scot, Fr John, and Eileen by phone. Tim said that his talks are aimed to be an evangelization opportunity to bring people back to the Eucharist – the source and summit of our Catholic faith. He said he plans to talk about several miracles that drew atheist and agnostic scientists to be faithful Catholics. Scot noted that Tim welcomes people to be skeptical of what he is saying, as long as they are not closed minded. Tim explained that asking concrete and intelligent questions are a healthy part of being skeptical, and a natural part of human curiosity. He explained that, even though information about Katya Rivas has been made very public, the people who dismiss it without watching video footage or reading the reports are not being skeptical, they just refuse to open their mind to listen to the facts. Tim and Scot talked about Tim’s background – Tim said that his sales background tainted him a bit against following anything that had emotion involved. It caused him to fall away from the Church, but after his mother’s death he started to come back. Tim continued, saying that the information that he will be discussing at St William’s is what made him come back – the factual validation of the faith gave him the confidence he needed to make a connection with God. Fr John said that we are a sacramental people – we believe in things beyond what we can see. Our entire sacramental life is based on trusting that God is in action in our world, Fr John continued, and that miracles are God’s way of reminding us that He is with us. Scot asked Tim to share an example of what he will be sharing in Tewksbury later this month. Tim said that he’ll be 43 in December, and his father will be 75. When his father grew up, they didn’t question their faith – for his father’s generation, it’s very odd that people need proof or question their faith. Tim gave the opinion that the culture of today is a very “see to believe” one. The greatest miracle we know, Tim continued, is the miracle that happens every day on the altar – when a priest consecrates a host and it becomes Jesus. If we truly appreciated this miracle, we’d be in the Church early, late, all the time on our knees worshiping. Tim related the story of a priest who was doubting the ability of God to work through him to consecrate – when he was celebrating Mass, the host turned to heart tissue and started to bleed. Tim said that before he came back to the Church, he and his wife were very caught up in the world. He said that understanding the treasure of the Eucharist has made him more compassionate and loving towards his wife and family, and to everyone around him. He said it’s very important that the Eucharist, what we call the sacrament of love, turned into heart tissue in this miracle. Scot said that Pope Benedict notes that many people in society try to pit science and faith against each other – contradicting that God gave us science to support our belief in Him. If we pursue science without preconceived ideas, Scot continued, we can see God’s work in all disciplines and lead us to the truth of God’s love for us. Tim said much of his information sidesteps traditional arguments about God with scientists – going right to the facts of the miracles. How, for instance, can a plaster statue of Jesus bleed or weep? Science doesn’t have an answer, Tim continued, and that’s where faith takes over.